With Xavier presumably out of the picture, Cyclops has finally taken the big step from field leader to strategic leader of the X-Men. But to say his methods stray from those of his instructor would be an understatement: take X-Force as a prime example. No longer the playground of Cable and his young recruits, the team is now Scott's black ops hit squad, here to complete the tasks that are deemed too dirty and too dangerous for the regular team. In last month's issue, the group's knack for getting their hands dirty came with a high cost. Having rescued Wolfsbane from a torturous imprisonment, the team brought the injured mutant back to the relative safety of Angel's home. But once there, their refugee snapped, suddenly lunging at her host and tearing the wings from his back. Now, with their Angel suddenly reverted to his darker, more macabre personality as Archangel, X-Force suddenly has to deal with battles on more than one front. However, Crain's tendency to overcomplicate the page reveals his unfamiliarity with basic page layout. His panels bounce around the page so recklessly and unexpectedly that the task of actually directing the reader's eye often falls to an overstretched word balloon. His disorganized storytelling may have been given some leniency were his illustrations a bit simpler, but with this kind of detail and this many moving pieces, there's frequently no way to tell which direction my eye is supposed to move. That makes the issue something of a chore to read, and spoils what would otherwise be a very solid artistic contribution. Writers Craig Kyle and Christopher Yost are thus far succeeding in their efforts to create an official X-Men title that doesn't feel like an "Official X-Men" title. The story's shadowy tone and constant bloodletting set it far apart from the more straightforward, flashy, gaudy books that have personified the line for so long. But because he's borrowing many faces from those other series, something just doesn't sit right. When Wolverine grins and mutters "Sixteen apiece. Kill 'em all," it feels like a totally different character than the one we've been following in Uncanny X-Men for so many years. "Kill 'em all"? What happened to rehabilitation, or even a simple berserker rage? In some instances, such as Archangel or Wolfsbane, these characters were stagnant, in need of a change, and the fresh take is necessary. 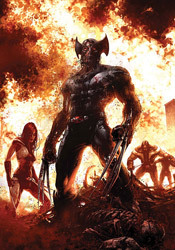 However, both of those examples come off as secondary characters in this issue, guest shots who ultimately give way to the focal points of Wolverine and his two buddies, X-23 and Warpath. I can't fault X-Force for striving to create something different within the mutant landscape. That's something it's needed for years, something with enough of an edge to uncover some unexplored corners within the X-Men universe. However, this issue seems like little more than the right attitude driven in the wrong direction. The story and artwork team up to deliver tons of atmosphere, but a thin angelic-themed plot feels more like a recent issue of Ghost Rider. Flip through it if you like, it holds a few surprises, but it's not what it should be or what the publisher needs it to be.